If you've ever used flashcards before and have something you need to learn quickly, then Memorize-It is for you. Memorize-It takes this idea to a whole new level with pictures,text, sound and the ability to consistently focus on the cards which give you the most trouble. You can also print the flashcards and take them with you. Since 1992 Memorize-It has been the best flashcard software available. Free support and money back guarantee. 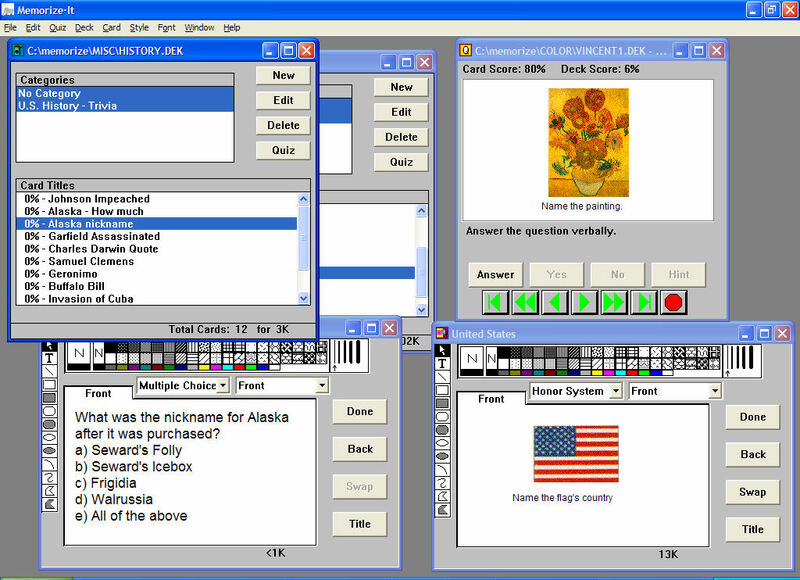 Flashcard software for creating, quizzing, and printing flashcards. ...... Interactive quizzing with Memorize-It automatically keeps track of the hardest cards and allows you to focus on exactly what is hardest for you. Decks can be printed front and back on five styles of perforated card stock paper. By using Memorize-It you can study or teach any subject. Memorize-It allows you to easily create the cards with exactly the information you need to study. Since 1992, Memorize-It has been the best flashcard software available. Free support and money back guarantee. The most easy, powerful and feature filled flashcard suite ever. This is an effective tool to help you learn foreign language. An audio-based Korean vocabulary flash-card program. Improve test scores. FREE to TRY! An audio-based Japanese vocabulary flash-card program. Qweas is providing links to Memorize-It Flashcards 4.0.5 as a courtesy, and makes no representations regarding Memorize-It Flashcards or any other applications or any information related thereto. Any questions, complaints or claims regarding this application Memorize-It Flashcards 4.0.5 must be directed to the appropriate software vendor. You may click the publisher link of Memorize-It Flashcards on the top of this page to get more details about the vendor.